Eating breakfast for most college students is unheard of. I know it was for me. However, it’s so important that we have a decent breakfast to kick start our day! I came across a simple recipe that I prepare on Sunday nights & eat throughout the week. They’re called egg muffins. I cook them, bag them in zip lock bags and just pop in the microwave on the way out the door during the week. Hope you all enjoy!! HEAT oven to 350°F. BEAT eggs, milk, salt and pepper in medium bowl until blended. ADD cheese, vegetable of choice, bell pepper and onion; mix well. SPOON evenly into 12 greased muffin cups, about 1/4 cup each. BAKE in 350°F oven until just set, 20 to 22 minutes. COOL on rack 5 minutes. REMOVE from cups; serve warm. 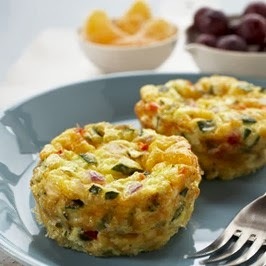 Quick breakfast solution: Bake egg muffins the night before and refrigerate. Quickly re-warm in the microwave in the morning. Lighter Option: Recipe can be made with reduced-fat cheese, if desired.